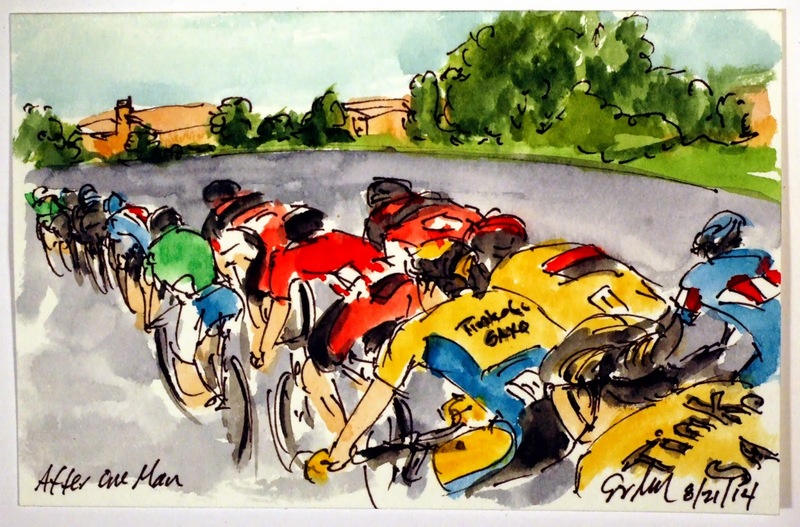 "Book de Tour" is a collection of my small watercolor and ink paintings from the 2014 Tour de France completed as the race unfolded on my television screen, showing what I believe to be the key moments of each stage. You'll understand my reasoning as each picture is annotated with my interpretation of what's happening and its importance in this high moving game of chess on wheels. 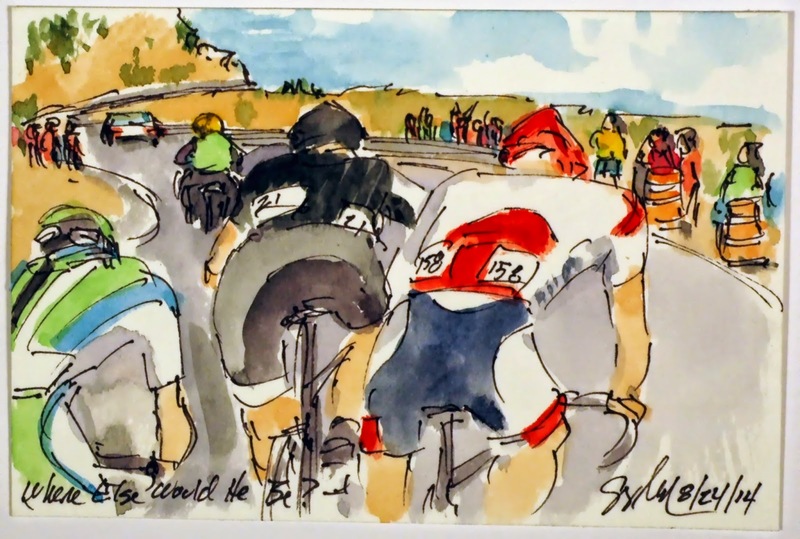 I love to work this way because, as I paint, the story’s conclusion is unknown and, the significance of what I record, unclear until the winner triumphantly crosses the finish line. Cycling’s an unpredictable sport and I love to capture and convey its intensity. 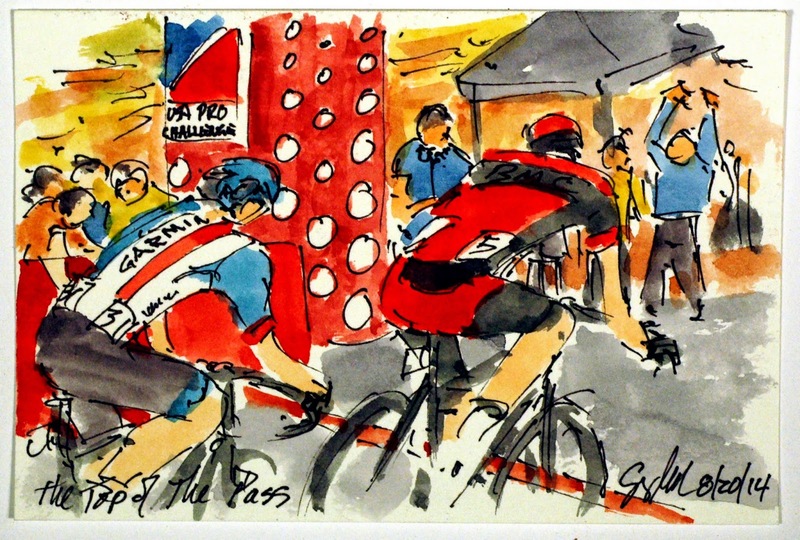 Each of the Tour's 21 stages and the first ever Women's Professional race on the streets of Paris will form a separate chapter in the book and tell the story of this year's race with bold strokes and washes of color as I capture the key moves, lung-searing attacks and counter-attacks, adrenaline-rushing descents, heart-breaking crashes, set amid the glorious landscapes of England, Belgium, Spain and France. It's truly a tale worth telling visually. The book is a soft cover 240 page collection adapted from many of the blog post that appeared here during the course of the race. 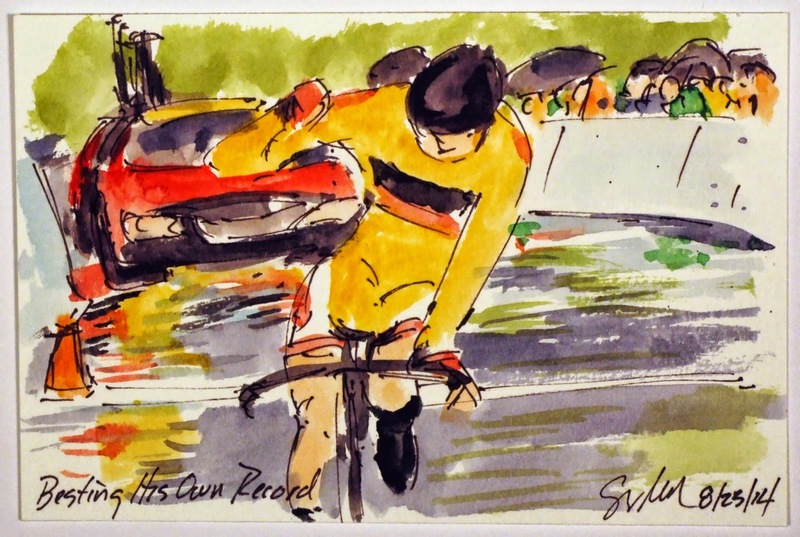 It includes many other additional paintings, a complete list of all of the teams and their riders who rolled out from Harewood House, and a glossary of terms. 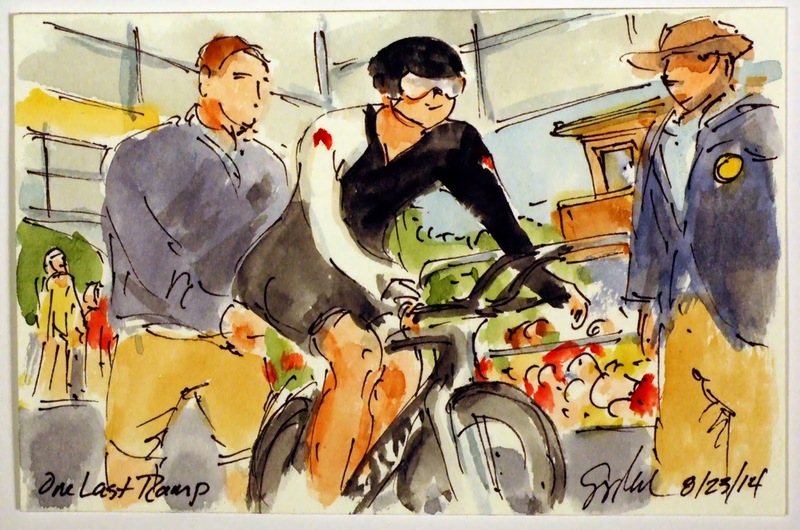 This is a story of the Tour that will delight fans of cycling, officiandos and novices alike, but will be just as captivating for lovers of art and watercolors. 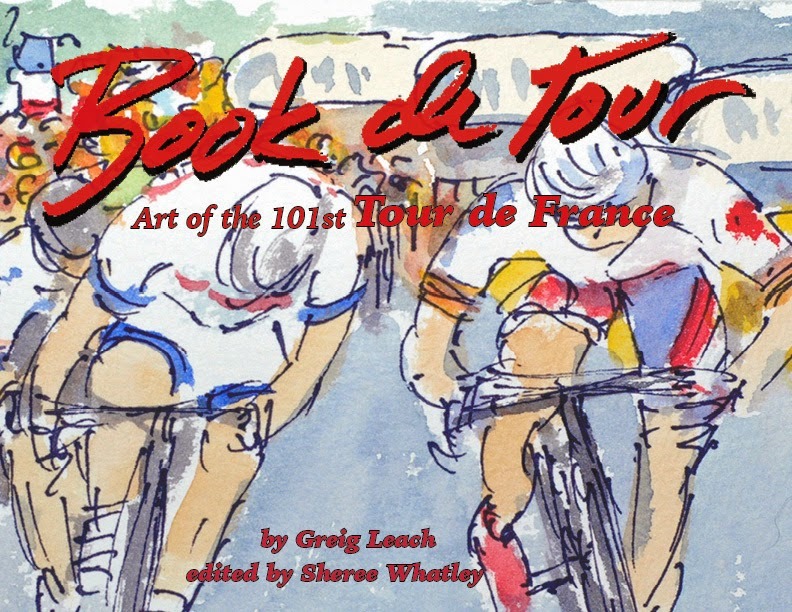 You need not love cycling and the Tour de France to savor this book, but it would hurt. To pre-order you copy for $29.95 USD just follow the direct link at the end of this post. International shipping is available. The book is in final stages of the pre-press process and will be ready to ship on or about November 1, 2014. 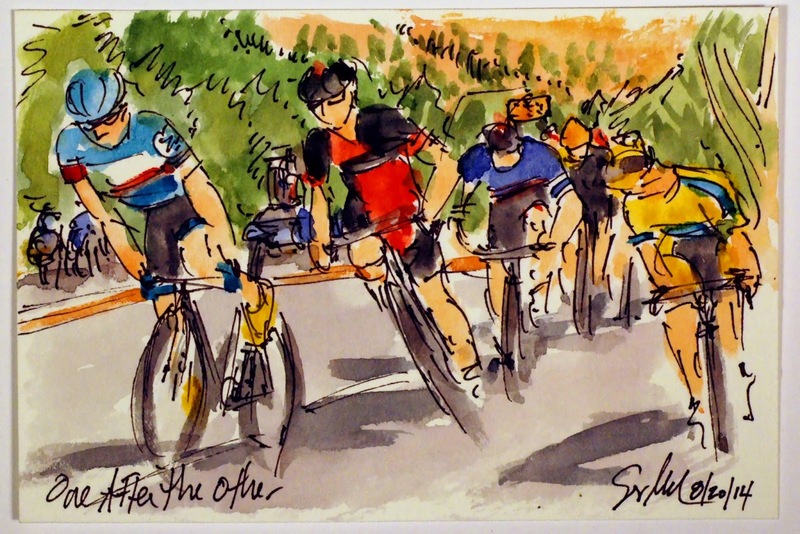 Best friends and training partners, Kiel Reijnen (UHC) and Alex Howes (Garmin Sharp) repeated their one, two finish from the opening stage of the US Pro Challenge, the difference here, they swapped the order. Reijnen's second place by the very slimmest of margins still ensured that his Green point's jersey would remain his on the final podium. Alex Howes' bike throw at the line was the margin of difference in the stage. One of Reijnen's teammates can be celebrate what he though was another stage victory for his compatriot, he may have been a little embarrassed when he learned the results. Tejay van Garderen (BMC) crossed the line with the Yellow Jersey firmly on his shoulders. He was so close to the front of the race because the did his best to lead out his teammate, Martin Kohler, a little unusual for the team leader and winner of the overall race. This is a small original watercolor and ink painting that is available through my artist website at www.greigleach.com. To purchase this 4"x6" painting for only $50 USD, just follow the direct link at the end of this post. But do hurry, this is a first come first served kind of a thing. In a repeat of is break away efforts of stage 4, Jens Voigt (Trek Factory Racing), was off the front in hopes of ending his professional racing career with a final race victory. Today he had the company of four others. He did attack that group, too, with only Javier Mejias (Team Novo Nordisk) able to catch the wheel of the fast disappearing German. The pair managed to hold off the charging peloton until the start of the final or bell lap of the downtown Denver, Colorado circuit. This is a small original watercolor and ink painting that is available through my artist website at www.greigleach.com. To purchase this 4"x6" watercolor painting, just follow the direct link at the end of this post. Remember, this is a first come first served sale of artwork, so don't delay! Not only was Lookout Mountain the final climb of the 2014 US Pro Challenge, it was the last climb of the man on the front of the break, Jens Voigt (Trek Factory Racing). I'm sure he will continue to ride up many, many mountains on a bike, but this was the last one under racing conditions. He was one of the five remaining members of the early break that still included, Mick Rodgers (Tinkoff Saxo), Reuben Zepuntke (Bissell Development), Tiago Machado (NetApp-Endura) and Javier Mejias (Team Novo Nordisk). A side note, Novo Nordisk is a team comprised completely of riders with type 2 Diabetes. They were started to show how one can live a full active life with the disease. Mejias hanging with three men who did well in the 2014 Tour de France certainly underscores the team's point. This is a small original watercolor and ink painting that is available through my artist website at www.greigleach.com. To purchase this particular 4"x6" painting, just follow the direct link at the end of this post. As the peloton went up the final climb of the 2014 US Pro Challenge, Phil Liggett was saying he didn't understand why Garmin Sharp had put most of the team on the front to drive the pace on the way up Lookout Mountain. It was his partner, Paul Sherwen, who knew that the boys in blue would want to eliminate as many sprinters as possible on the step climb on the outskirts of Golden, CO. Phillip Gaimon and Gavin Mannion are looking back down the mountain to see if they have shucked Cannondale and their sprinter, Elia Viviani. Without the fast Italian, Garmin felt sure their man Alex Howes would be able to get the win he so narrowly missed on the opening stage of the race. This is a small original watercolor and ink painting that is available through my artist website, www.greigleach.com. To purchase this 4"x6" painting for only $50 USD, just follow the direct link at the end of this post. The break having lost one of its fold powered south along the edge of the Rocky Mountains before swinging through Golden, Colorado, for the first of two trips through town. The road down from Boulder is beautiful, long, straight and surprisingly flat. The big man, Jens Voigt (Trek Factory Racing) swings off of the front, passing the task of breaking the wind to Jesse Anthony (Optum). The eleven man group was building a good gap over the BMC lead peloton by working together, each taking their fair share of time with their noses in the wind. This is a small original watercolor and ink painting that is available through my artist website at www.greigleach.com. To purchase this particular 4"x6" painting, just follow the direct link at the end of this post. But while you are at the website, why not browse all of the artwork on offer. International shipping is available. US Pro Challenge Stage 7: Where Else Would He Be? Jens Voigt (Trek Factory Racing), as everyone in and out of cycling most likely knows, would be retiring from the sport at the end of today's racing. While many would just pedal around the course, Voigt set off in the early bread with every intention of winning the final stage of his final race. He spent most of the day on the front driving the pace of the twelve man break. Two of his break away compatriots where Reuben Zepuntke (Bissell Development) and Cameron Wurf (Cannondale), they had to be struggling to hold the wheel of the extremely motivated German. Wurf later dropped off the pace to be there to help the Cannondale sprinter, Elia Viviani, in hopes of getting him over the only climb of the day. This is a small original watercolor and ink painting that was created using Yarka St. Petersburg watercolors and Steve Quiller brushes from the family run art supply company, Jack Richeson & Co., www.richesonart.com. 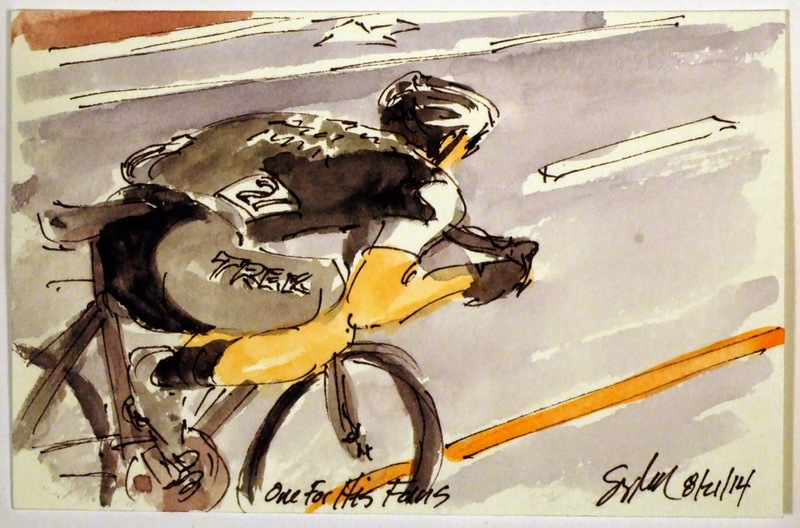 This painting, and indeed all of my cycling art, is available through my artist website at www.greigleach.com. To purchase this 4"x6" painting, just follow the direct link at the end of this post. Tejay van Garderen (BMC) came back to his home stage of Colorado with something to prove. 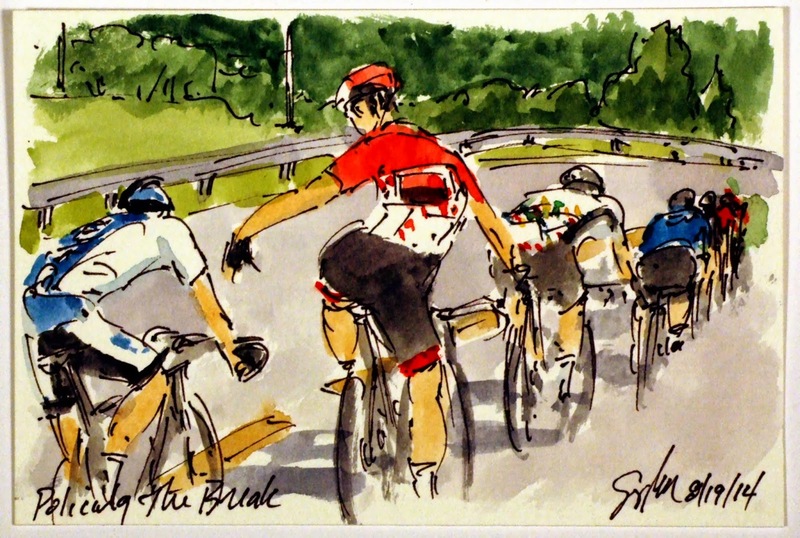 He is defending his win of the 2013 US Pro Challenge and has been gaining time on his rivals in virtually every stage of the 2014 edition of the race. With his nearest competitor starting the day 20 seconds down, van Garderen could have sat back and played it safe today, but just like Vincenzo Nibali in the Tour this year, van Garderen came to stamp his authority on the race. He already holds the record for the ascent of this very course up to the Vail Pass, a record of 25 minutes and 2 seconds. Today as he crossed the line he punched the air, and punched a hole in his own record completing today's time trial in 24 minutes and 26 seconds. He covered the course 36 seconds faster in the pouring rain, obviously he wasn't just playing it safe. The first racer to congratulate him at the finish line was the now second fastest on the day, Tom Danielson (Garmin Sharp). 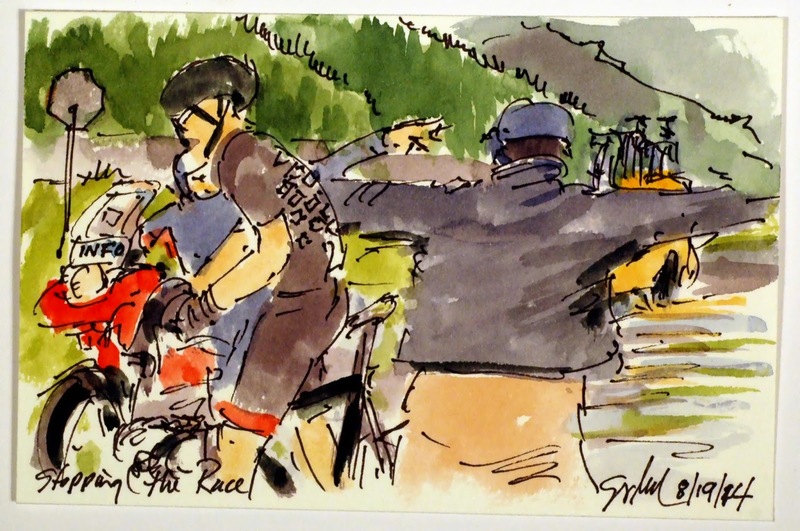 Danielson said into van Garderen's ear (a little too loudly for TV), "You are on fast MFer" as he gave the near certain winner of the 2014 US Pro Challenge a big hug. Danielson could afford a certain amount of generosity, he had just ridden hard enough to put himself into second overall. This is a small original watercolor and ink painting that is available through my artist website at www.greigleach.com. To purchase this 4"x6" watercolor and ink painting, just follow the direct link at the end of this post. Serghei Tvetcov (Jelly Belly-Maxxis) has been one of the surprises of the US Pro Challenge riding third in the overall getting the better of many riders of the ProTour teams. Jelly Belly is one of the longest continuous team sponsors in the United States giving many riders their first contracts as professional cyclist. After today's second placing at the time he cross the line, I am sure someone from the 22 ProTour teams will be looking to sign the former Romanian Time Trial Champion. 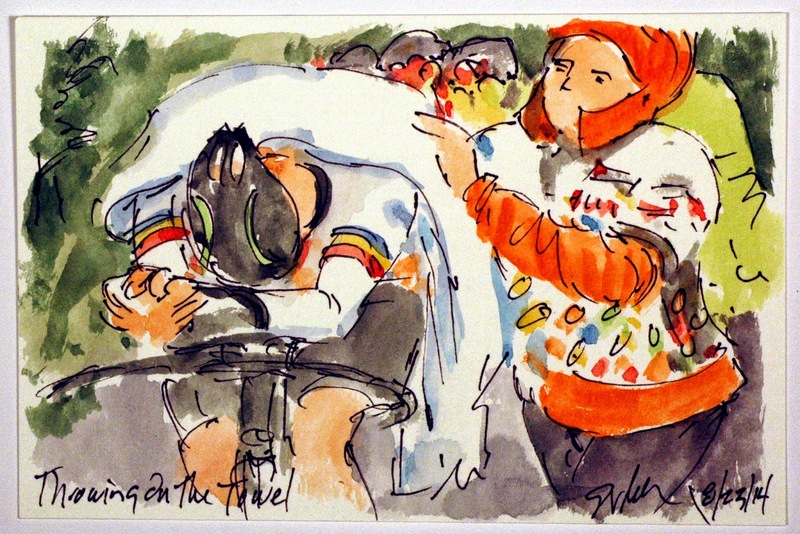 With the cold rain and total exertion, most soigneurs wrapped their charges with a dry towel. Once they were off of their bikes, they would be handed try jackets and warm blankets in hopes of getting their body temperatures adjusted as quickly as possible. This is a small original watercolor and ink painting that is available through my artist website at www.greigleach.com. To purchase this 4"x6" painting, just follow the direct link at the end of this post. Tom Danielson (Garmin Sharp) had his work cut out for him on the penultimate day of the US Pro Challenge. Danielson started the day just off of the podium in 4th place and trailing the race leader by just over a minute and a half. Danielson has gone faster than Tejay van Garderen on this very course, but to gain that much time, he will have to count on an extraordinarily bad ride on the part of wearer of the yellow jersey. The Garmin Sharp rider certainly was doing his part, at the first time check he went through with the new best time, 26 seconds faster than the current stage leader, Mick Rodgers (Tinkoff Saxo). This is a small original watercolor and ink painting that is available through my artist website at www.greigleach.com. To purchase this 4"x6" painting for just $50 USD, just follow the direct link at the end of this post, and yes, international shipping is available. The individual time trial is about maximum exertion over a relatively short amount of time. Today's uphill course was only 16 kilometers that took Mick Rodgers (Tinkoff Saxo) just over 26 minutes to complete, the best time by 20 some seconds when he crossed the line. 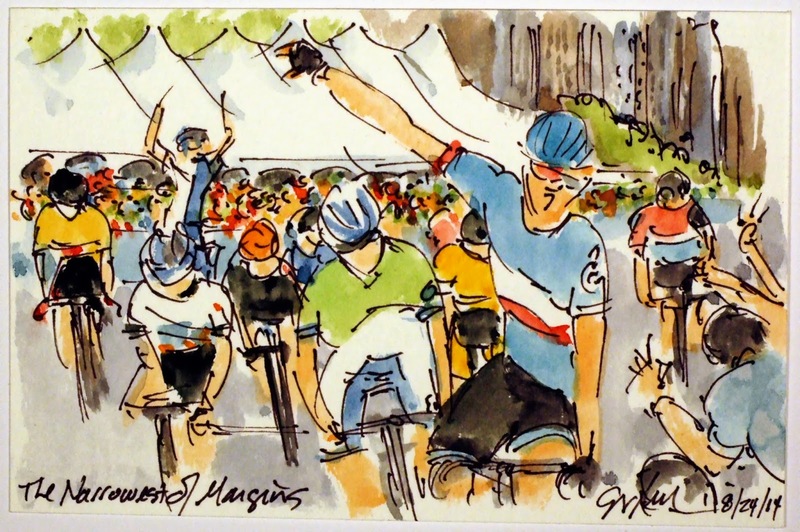 Unlike a road stage, a rider has to wait until everyone has completed the course before he knows if his effort was enough to claim victory for the stage. To ensure that the riders don't collapse as they cross the line, volunteers and team soigneurs will rush out and push the riders further up the road where they can safely dismount when they are able. Rodgers knew that the man who held the record on this course, Tejay van Garderen (BMC) would be coming across the line in about a half hour, and the man who had once beat that rider, Tom Danielson (Garmin Sharp) was also still on the road. This is a small original watercolor and ink painting that is available through my artist website at www.greigleach.com. To purchase this 4"x6" painting for only $50 USD, just follow the direct link at the end of this post. But while you are there, why not take the time to browse all of the art on offer? Jens Voigt (Trek Factory Racing) has been doing quite a number of things for the last time this season. This race is no exception. I am sure he was happy to be doing his very last individual time trial. When I raced, I dreaded the time trial, and I wasn't very good at it either. Voigt is not a time trial specialist, but as he showed in stage 4, he as the power to sustain an incredible amount of effort at maximum speed. With this long drag up the pass outside of Vail, Colorado, it would require just that amount of effort to carry the day. This is a small original watercolor and ink painting that was created using Yarka St. Petersburg watercolors and Steve Quiller brushes from Jack Richeson and Company, a family run artist supply company in Wisconsin, www.richesonart.com. They are great people who sell some fabulous art materials. 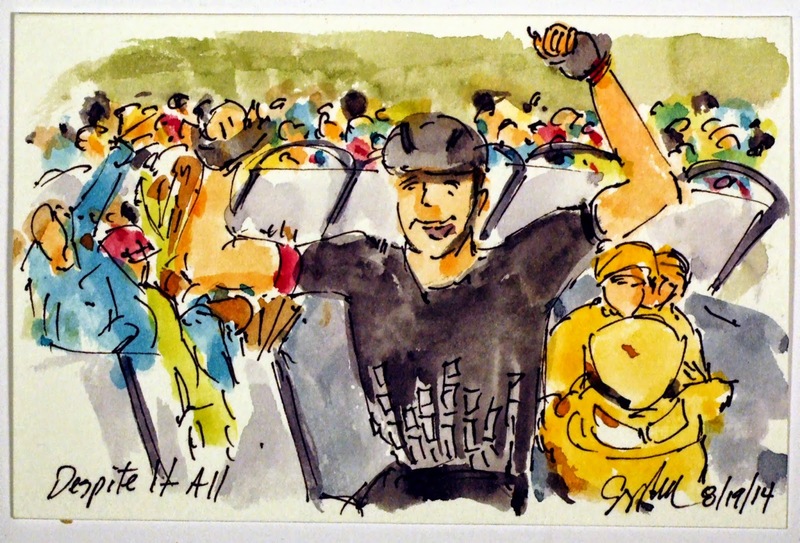 This painting is available (as is all of my cycling art) through my artist website at www.greigleach.com. To purchase this 4"x6" painting, just follow the direct link at the end of this post. But don't delay, the art is sold on a first come first serve basis. Tejay van Garderen (BMC) soft pedaled after crossing the line in Breckenridge chatting with Rafal Majka (Tinkoff Saxo) most likely about just how miserable the stage was. In Colorado, the rain is always ice cold, so combining that with temperatures in the high 40's Fahrenheit, the pair who sit in first and second overall shared a moment of relief to be done with the day. Tejay's teammate, Ben Hermans lost time and his third place overall on his descent off of the big pass of the day which aloud Tom Danielson (Garmin Sharp) to move on to the current podium in third place. He lost 5 seconds to this pair ahead of tomorrow's time trial up the Vail Pass. This is a small watercolor and ink painting that is available through my artist website at www.greigleach.com. To purchase this 4"x6" painting for $50 USD, just follow the direct link at the end of this post. 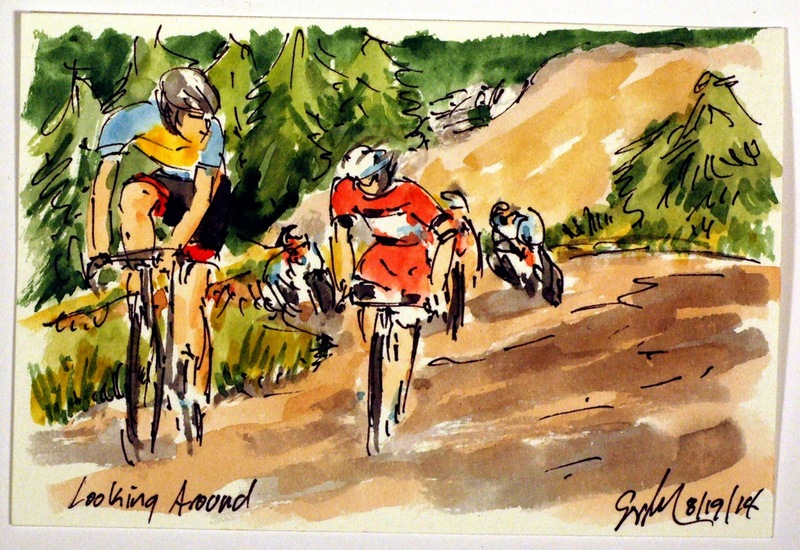 There are three years of cycling art to choose from there as well. Laurent Didier (Trek) was the first to cross the line in Breckenridge, taking the first stage win for Trek Factory Racing. The team had just missed a stage win yesterday with crowd favorite, Jens Voigt, when Didier himself had tried to slow the peloton to prevent the catch of the retiring German. Today was also the first race stage win of his career outside of his two Luxemburg National Championships, one in the time trial and one on the road. (According to Phil Liggett and Paul Sherwen) One of the aids to watching a race in person are the giant video screens (just over the riders' shoulders) along the finishing straight, although today they weren't showing much racing due to the weather. This is a small original watercolor and ink painting that is available through my artist website at www.greigleach.com. To purchase this 4"x6" painting, just follow the direct link at the end of this post. But while you are there, why not take the time to browse all of the artwork on offer. 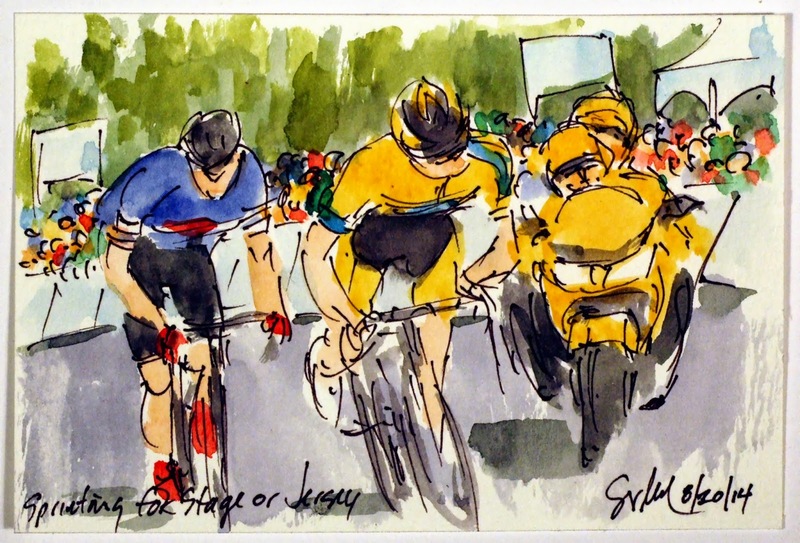 Be forewarned, there is quite a few cycling paintings, from three seasons of racing. It was a miserable day for racing in Colorado today. It was equally miserable for the commentators and spectators who had no video coverage to watch. The images are caught several ways all effected by the weather. Helicopters that fly above the peloton not only couldn't see the riders due to the cloud cover peaks, they couldn't see the peaks themselves, not exactly the safest way to fly. Without the transmitters in the sky, the images from the motorbikes were not visible either. So it wasn't until the leaders swung through the town of Breckenridge, pass the stationary cameras did we get to see the rather wet, chilled men of the break away. The four to summit the high pass then dropped like stones into town before heading out for another climbing loop. Janier Acevedo (Garmin Sharp) led his teammate, Ben King along with Laurent Didier (Trek) and Rob Britton (Smart Step) through the ski resort town in front of hundreds of rain soaked enthusiastic fans of cycling. This is a small original watercolor and ink painting that was created using Yarka St. Petersburg watercolors and Steve Quiller brushes from Jack Richeson & Co., www.richesonart.com. 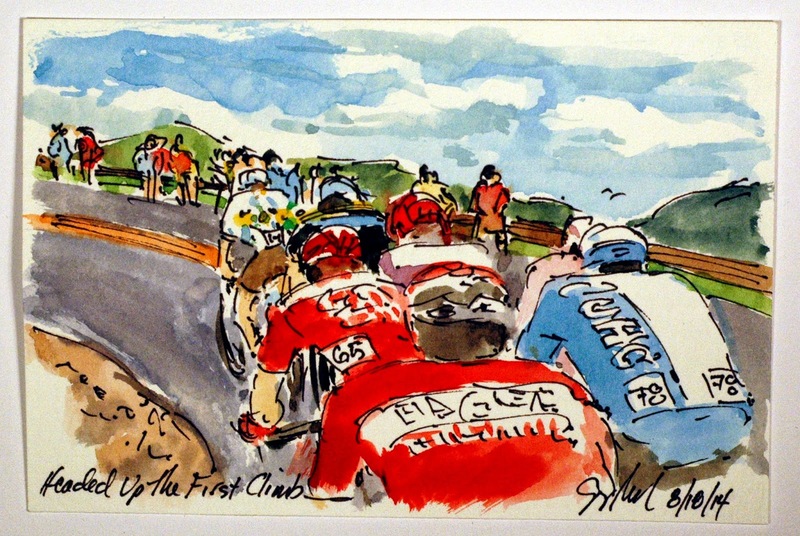 This painting, and all of my cycling art, is available through my artist website at www.greigleach.com. To purchase this 4"x6" painting, just follow the direct link at the end of this post. When asked if he would be given an honorary lap of the Champs Elysees before riding his final stage of the Tour de France, Jens Voigt replied, "Honor in cycling is not given, it is earned." Today he was not given a stage victory and he came 750 meters short of earning the victory as well. 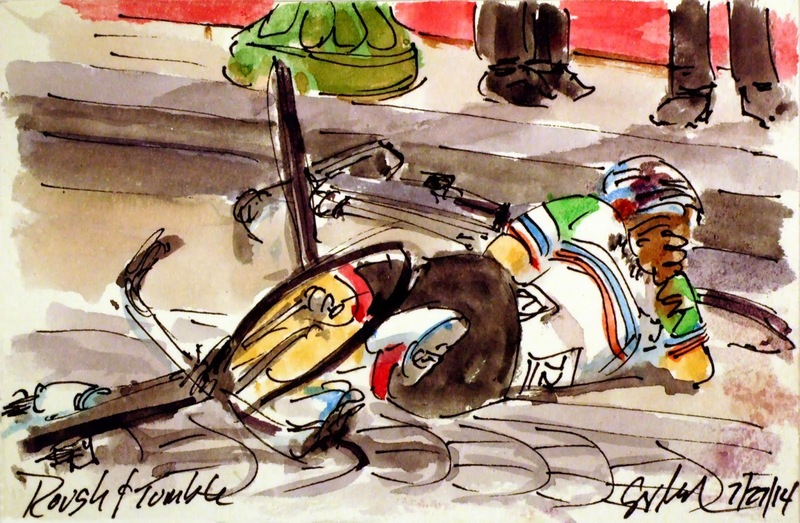 Just as he attacked on the Champs Elysees, but did not win the stage. 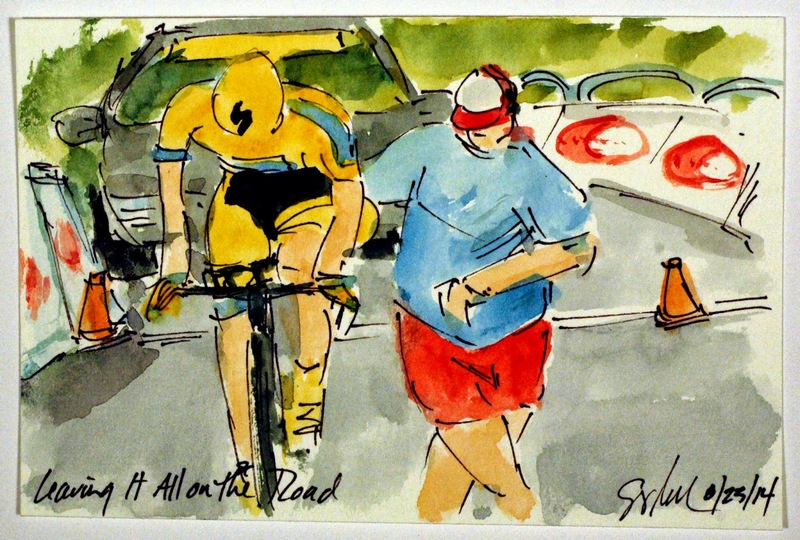 However, he has won the hearts of cycling fans around the globe, and today reached out, high fiving scores of those along the side of the road as he rolled towards the finishing line behind the peloton. Once he had been caught, there was no reason to keep racing. 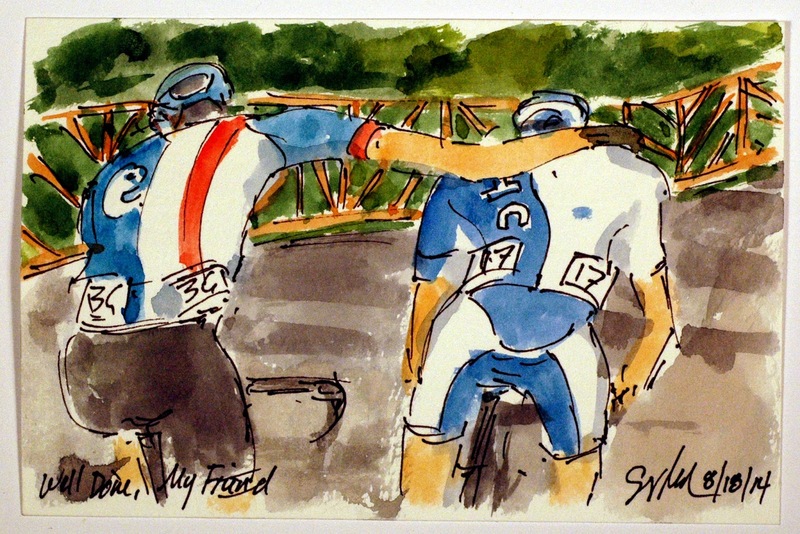 He will need a very long arm indeed to high five all of those who are fans of this senior statesman of cycling. This is a small original watercolor and ink painting that is available through my artist website at www.greigleach.com. To purchase this 4"x6" painting just follow the direct link at the end of this post. 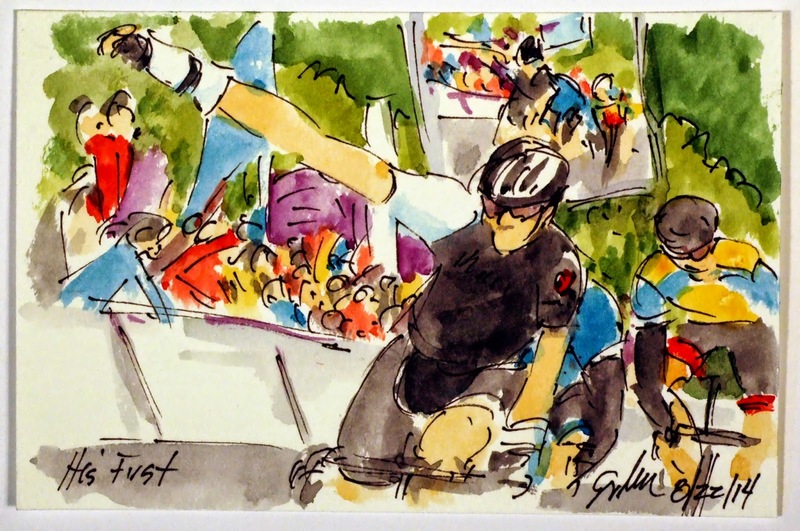 Be warned, this is a first come first served chance to own one of the last paintings done live from Jens Voigt racing. Nothing is given in the professional peloton, no prizes for a retiring warrior, just hard fast racing in every stage of every race. Despite all of his effort and the will of nearly every sportscaster, cyclist, racing fan and German, Jens Voigt (Trek) was caught with just 750 meters left to the finish line by the men that wanted to get their sprinter first across the line. Cannondale had been doing quite a bit of work at the front of the peloton all day to keep the break away in check and had done a heroic effort to catch Voigt by the final kilometer. Elia Viviani (Cannondale) seemed too far back to be a factor at the outset of the sprint, but then found the wheel of the Hincapie Sportswear man and waited for the right moment to bounce. Viviani had raced well in the early season, so it was a pleasure to see his excitement with this victory. This is a small original watercolor and ink painting that is available through my artist website at www.greigleach.com. To purchase this 4"x6" painting, just follow the direct link at the end of this post. The sprinter's teams were not happy to have such a strong man as Jens Voigt (Trek) up the road and set after him at full speed. 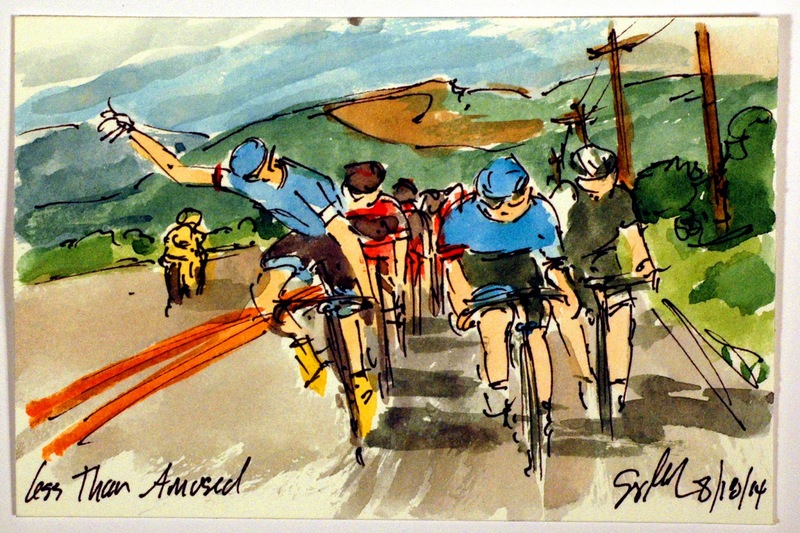 Normally the peloton can go considerably faster than a lone rider, just be virtue of those on the front of the peloton being able to take turns in the wind and in the slipstream, while the man out front is pushing against the wind all of the time. There is a rough formula, that the break needs at least a minute per kilometer to the line if it is going to have a chance of staying away. The peloton was only a minute and a half behind with five kilometers to go, but it was Jens Voigt who was out front. Another variation in this race was Trek had broken the tradition and actually put Frank Schleck and Laurent Didier on the front to disrupt the sprinter's trains and the peloton's chase, hoping to give their man the honor he so richly deserves. Tucked into this group are the race leader, Tejay van Garderen (BMC), second place Rafal Majka (Tinkoff Saxo) the current Sprint jersey on the shoulders of Kiel Reijnen (UHC) and the KOM jersey of Ben Hermans (BMC). BMC had no interested in catching the German, but many others had hopes of taking out the stage win. This is a small original watercolor and ink painting that is available through my artist website at www.greigleach.com. To purchase this 4"x6" painting, just follow the direct link at the end of this post. Jens Voigt (Trek Factory Racing) went to the sign in board with a variation to his team's jersey. Written in a lovely script were the words, "Thank you, fans!" It was a lovely sentiment from a pro of 17 years who knows were the support ultimately comes from. He may have planned to combine the jersey with the actions he has now set into play. With the ascent up into the Garden of the Gods, Voigt quickly got a sizable gap on the break away and set off in search of the stage victory that would cap an already brilliant career. Voigt has said that he wanted to leave racing while he was still competitive and he certainly proved his capabilities in the final lap of the Colorado Springs circuit. This is a small original watercolor and ink painting that is available through my artist website at www.greigleach.com. To purchase this 4"x6" painting, just follow the direct link at the end of this post. Two members of the early break had marked this day on their race books as a day they could make something happen. Ben Jacques-Magnes (Jamis) felt sure he could take back his King of the Mountains jersey that he surrendered to Tejay van Garderen the day before. With Tejay racing for Yellow, he was interested in the KOM points or being in the break away. 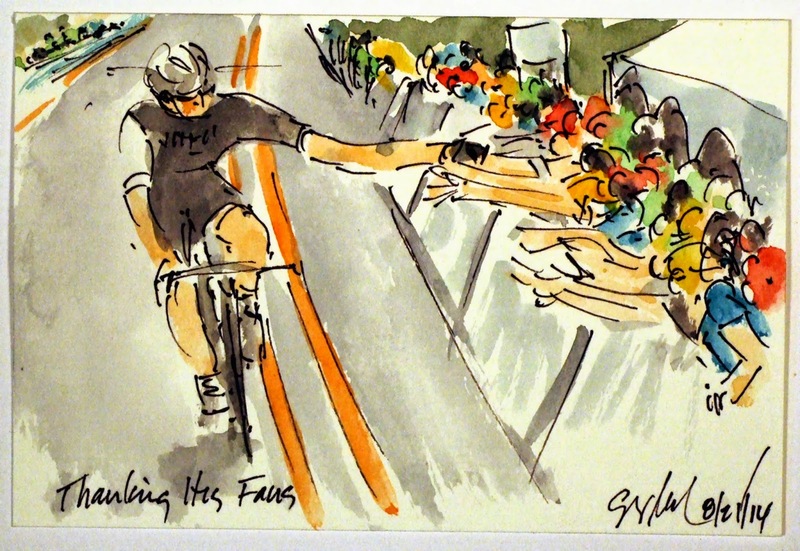 Jens Voigt (Trek) is racing his last professional race and wanted to go out with a victory. 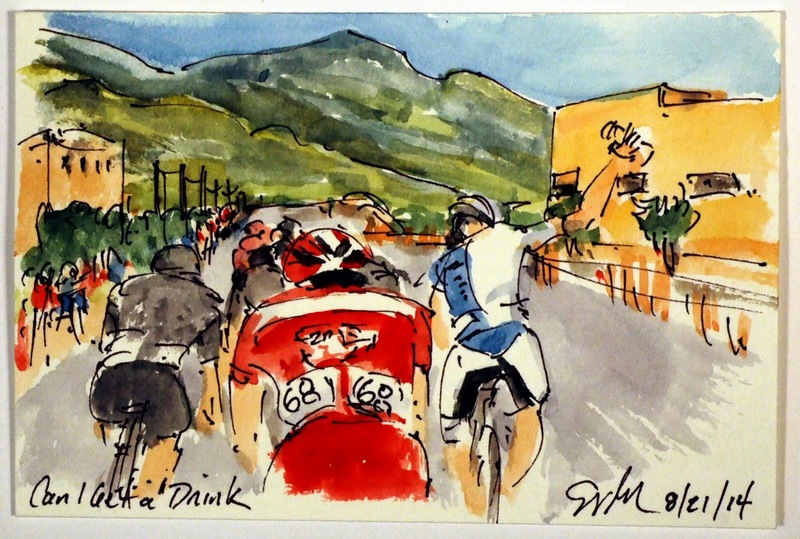 The day's short climbs, twisty roads and sections of open flat stretch were well suited to a man of Voigt's talents. 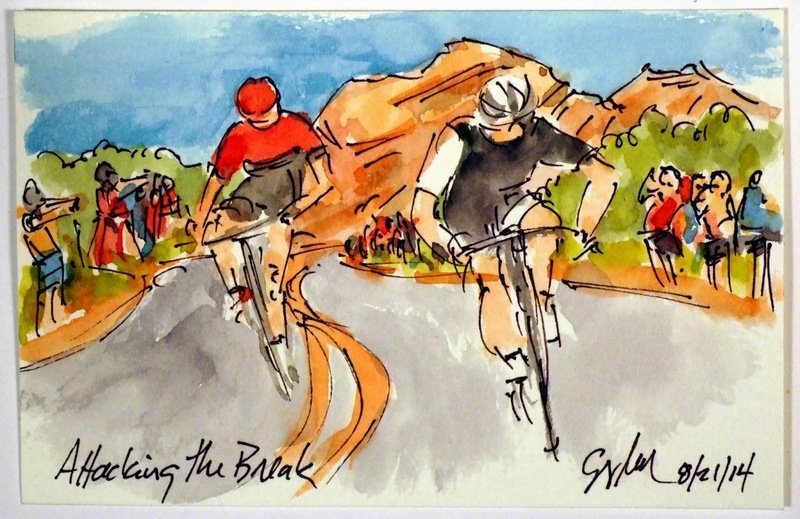 The pair attacked their break away companions on the final ascent in the Garden of the Gods that would award KOM points, Jacques-Magnes for the points, and Voigt as a perfect launch pad for an attempt for a solo run to the finish. The fly to the line was quite similar to his opening stage of the 101st Tour de France. This is a small original watercolor and ink painting that is available through my artist website at www.greigleach.com To purchase this painting, just follow the direct link at the end of this post. But while you are there, why not take the time to browse all of the art on offer? 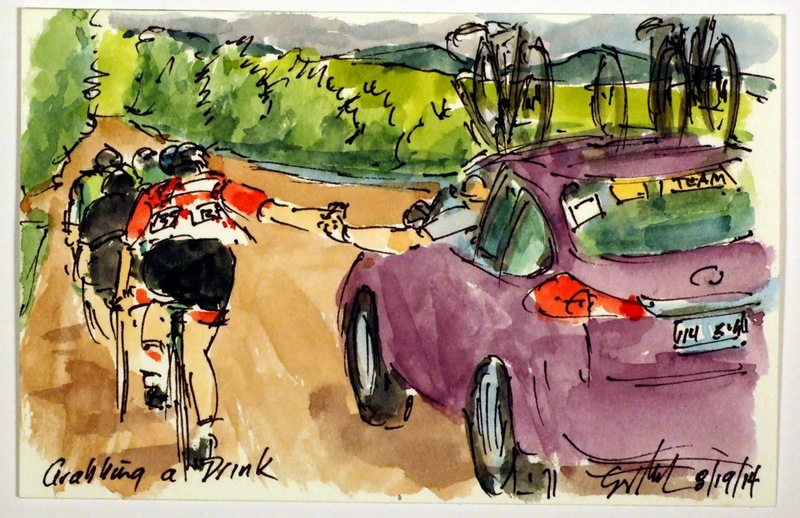 US Pro Challenge Stage 4: Can I Get a Drink? Daniel Summerhill (UHC) may have been channeling his inner bar fly as he raised his bottle aloft to let the race referee and his team car know that he wanted another drink. It is one way to catch a busy bartender's eye, lifting you bottle in the air, a universal sign for I want another, please. While you will see the same gesture in the ProTour races, here it is more important as the teams are without radios to let their needs be known. Summerhill and eleven others form the sizable break away on the circuit race around Colorado Springs and the Garden of the Gods. Some of the other riders included Wesley Sulzberger (Drapac), Ben Jacques-Magnes (Jamis) and the irrepressible Jens Voigt (Trek). This is a small original watercolor and ink painting that was created using Yarka St. Petersburg watercolors and Steve Quiller brushes from Jack Richeson and Company, www.richesonart.com. In addition this painting is available through my artist website at www.greigleach.com and to get this particular painting, just follow the direct link at the end of this post. The pair that came together to the line on Monarch Mountain, had been the protected riders for their respective teams, both hit the front hard and sprinted together for the summit. However the day and the stage were to go to the celebratory Tejay van Garderen (BMC), he had gotten enough separation to take over the lead in the race and had garnered enough KOM points to take the jersey from Ben Jacques0Magnes (Jamis). Rafal Majka (Tinkoff Saxo) did not gain any jersey or stage wins to add to his palmares, but he did move himself into second place in the overall with Tejay's teammate, Ben Hermans just a second behind him. Tom Danielson (Garmin Sharp) lost time but still managed to hold fourth place overall. This is a small original watercolor and ink painting that is available through my artist website at www.greigleach.com. To purchase this painting, just follow the direct link at the end of this post. 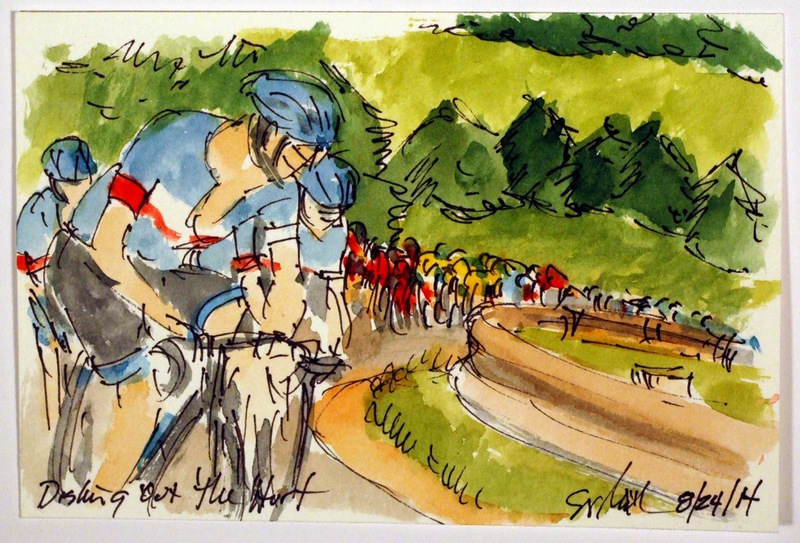 But while you are at the website, why not take the time to look at all of the cycling art that is on offer. 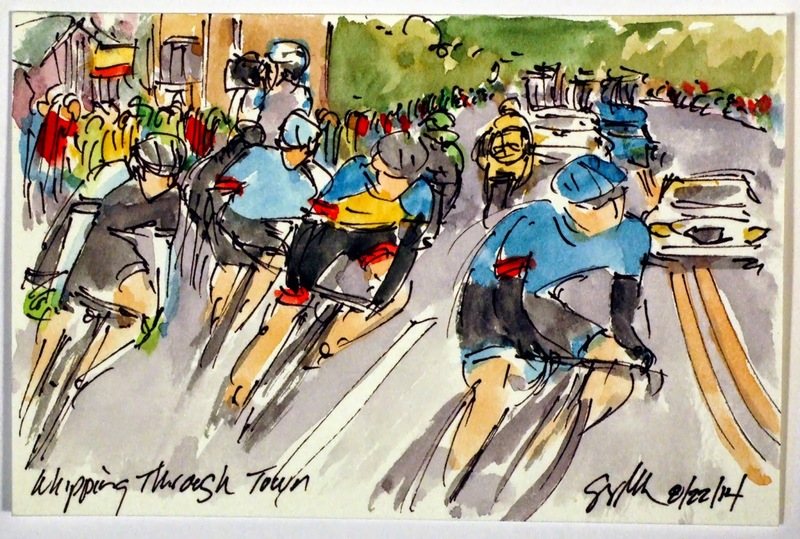 There is quite a few paintings from the 2014 ProTour season still available. Once everyone had tried attacking Tejay van Garderen (BMC), he used the last attack to launch his own acceleration under the one kilometer to go banner. The only rider who could stay with the attacking Coloradan was the Polish climbing phenon, Rafal Majka (Tinkoff Saxo). The pair had rid themselves of all of the others and sprinter the final meters up the final section of the climb. 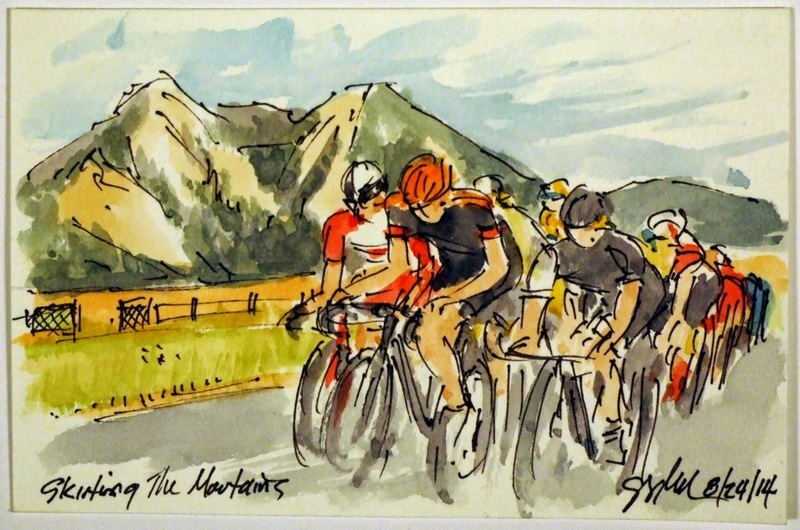 They were racing for the stage, and van Garderen would almost surely take over the Yellow Jersey, with double points for the King of the Mountain competition on offer, he could end up holding three jersey; the yellow of race leader, the polka dots of King of the Mountians and the royal blue of best place Coloradan. 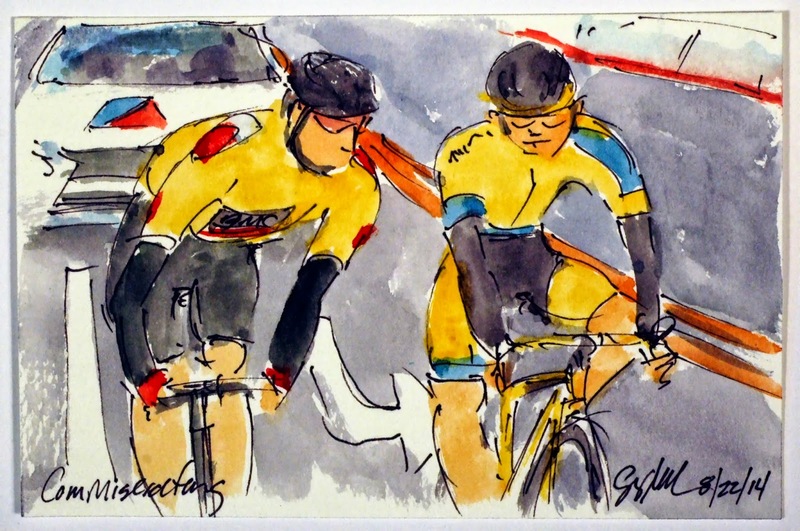 This pair also displayed that the form they had shown in the Tour de France had not yet faded away. This is a small original watercolor and ink painting that is available through my artist website at www.greigleach.com. To purchase this particular painting, just follow the direct link at the end of this post. Every rider aspiring to wear the Yellow Jersey knew that they had to attack the defending champion, Tejay van Garderen (BMC) if they wanted to have a chance to still be in the lead after the uphill time trial to Vail on Saturday. 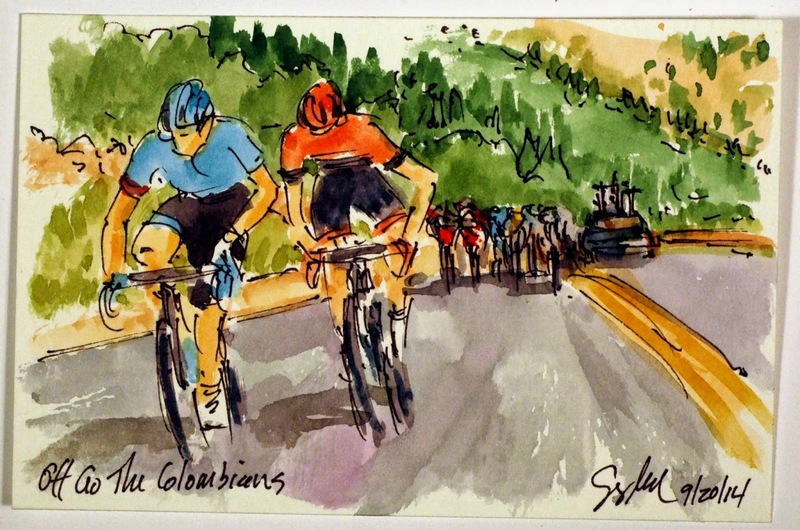 First it was Mick Rodgers (Tinkoff Saxo), then the Colombian pair, followed by another Tinkoff Saxo man, Bruno Pires. Finally, Tom Danielson (Garmin Sharp) decided he had to be aggressive to get the better of the man currently in the royal blue jersey of the best place Colorado native, van Garderen. The BMC leader was fortunate to have such a strong teammate to do the quick chasing in the form of Ben Hermans, not that Tejay was having any problems pulling the attackers back. This is a small original watercolor and ink painting that is available through my artist website at www.greigleach.com. For this painting, just follow the direct link at the end of this post. In the last couple of years you can be sure that when the road points up there will be a Colombian rider on the front of the race. Today these two countrymen from opposing teams seemed to chat at the back of the small, select peloton before jumping out of the back of the group. David Alexander Jaramilo (Jamis) and Janier Alexis Acevedo (Garmin Sharp) had waited for the steepest section of the course they could fine hoping their hard acceleration and combined attack would be enough to win the day for one of them. This is a small original watercolor and ink painting that is available through my artist website at www.greigleach.com. To purchase this painting, just follow the direct link at the end of this post. Do hurry though, it is a first come first served kind of a thing. 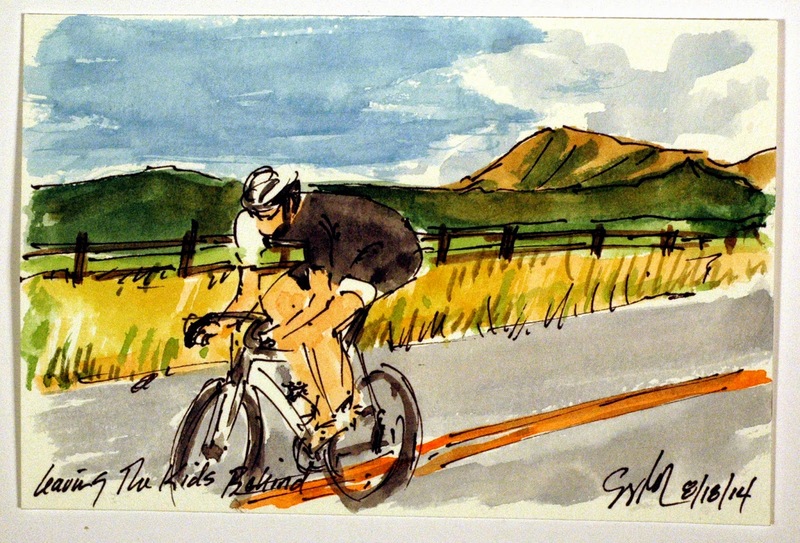 On the final climb of the day, up the Monarch Mountain, Mick Rodgers (Tinkoff Saxo) went off hoping to repeat his mountain top stage win in the Pyrenees in this year's Tour de France. He had bested Tejay van Garderen (BMC) on that stage, and figured he would have no problem achieving that feat again. With Rodgers up the road, Tinkoff Saxo had another card to play back in the select peloton with the winner of the King of the Mountains of the Tour, and the winner of the Tour of Poland, Rafal Majka. As the Australian toiled up the long 6% climb he had only the neutral service moto and the race escorts for company on the wide open roads of Colorado. This is a small original watercolor and ink painting that is available through my artist website at www.greigleach.com. To purchase this painting for only $50 USD (+ shipping) just follow the direct link at the end of this post. Stage 3's elevation map showed the riders going almost straight up from the beginning of the stage, down the other side and then right back up again. Ben Hermans (BMC) went out early so he could be out front to help his team leader, Tejay van Garderen later on. He was the first to crest the first King of the Mountain point on the top of Monarch Pass, with van Garderen's main rival, Tom Danielson (Garmin Sharp) stuck onto his wheel. The US Pro Challenge uses a variation of the Tour de France's Polka Dot Jersey of the KOM leader. The one in Colorado is a pattern of ever smaller white dots on a red field as opposed to the even pattern of red polka dots on the white jersey of the Tour. However neither of these guys are after the jersey currently worn by Ben Jacques-Magnes (Jamis). Danielson is out to win the race overall. This is an original small watercolor and ink painting that was created using Yarka St. Petersburg watercolors and Steve Quiller brushes from Jack Richeson & Co. (www.richesonart.com) a small North American family run art supply company. The painting is available for purchase through my artist website at www.greigleach.com. For this painting just follow the direct link at the end of this post. But while you are at the website, you should take the time to browse all of the art on offer. Despite all of the drama of stopping the race, the slippery descent off of Kaliber Pass into Crested Butte, it was still Robin Carpenter (Hincapie Sportswear) who raised his arms in a joyous victory salute on the summit of Mount Crested Butte. Two others profited, Tejay van Garderen (BMC) was able to put time into the rest of the favorites and Alex Howes (Garmin Sharp) took over the Yellow Jersey. Oddly the stoppage in the valley became the final times for the riders on the stage which I am sure further angered the riders who had just raced hard up the short steep climb. Carpenter had the stage win either way the first to reach the neutralization point and the first to reach the finish line. This is a small original watercolor and ink painting that is available through my artist website at www.greigleach.com. If you would like to purchase this painting follow the direct link at the end of this post. On rare occasions races need to be stopped or neutralized for safety sake. Never an easy thing to decide and even more difficult to perform. Worst of all, no one is ever happy with how and why it is done. With the skies opening up and dumping buckets down on the break away and the peloton alike as they summit the final climb, it was apparent that the muddy descent would be very dangerous to do at speed. /The problem was, the racers weren't stopped and the time gap taken at the summit, the organizers let them race the dangerous descent and then stopped them in the valley once they reached the paved highway. It was relatively easy to stop the solo leader, Robin Carpenter (Hincapie Sportswear), but stopping a charging diminished peloton pressing their advantage was far more of a challenge. Facing there verbal abuse for stopping them once the danger (if not the rain) had passed was not for the feint of heart. With a neutralization, when the racing starts again, the riders are set off at the same time gap intervals that they were at when racing stopped. All are now rested and angry, so the re-start can't help but shake up what may well have been the results otherwise. This is a small original watercolor and ink painting that can be yours by visiting my artist website at www.greigleach.com. To buy this particular painting, just follow the direct link at the end of this post. Just a few atypical aspects of this painting, usually road races are conducted on paved roads and despite the quality of its surface, this remains a dirt road. The other deviation is team cars without the full tricked out paintjobs showing logos, team names and the principle team sponsors. I assume it was to expensive to bring cars from Europe for the ProTour teams or it was just a chance for a car company to participate as a sponsor. The latter seems to be the case given the descriptions of the vehicles given by Phil Liggett at some part of each broadcast. Regardless, the sports director still hands bottles out of the car this time to the inaugural King of the Mountains' Jersey wearer, Ben Jacques-Magnes (Jamis-Hagens Bergman). The jersey was won on his break away in the opening stage of the Challenge and is being further solidified today. The only thing that may rain on his parade are the darkening clouds gathering on the horizon. This is a small original watercolor and ink painting that is available through my artist website at www.greigleach.com. To purchase this particular painting, just follow the direct link at the end of this post. They are only $50 USD, plus shipping. As the road up to the pass got steeper and steeper, the leading group got smaller and smaller. Michael Torckler (Smart Step) and Jai Crawford (Drapac) had put in a hard acceleration and now are looking around to see who they had gotten rid of. Just behind the pair is the current holder of the King of the Mountains Jersey, Ben Jacques-Magnes ( Jamis Hagens Bergman). He in turn is followed by the referee and time keeper motorcycles, and then it is the splintered remnants of the early break. Fortunately the rain has not yet fallen on the hard pack dirt of the 17 mile climb to the summit. This is a small original watercolor and ink painting that is available through my artist website at www.greigleach.com. To purchase this particular painting just follow the direct link at the end of this post. But don't delay, you wouldn't want to miss out on this one of Bridget's favorites. There are two routes from Aspen to Crested Butte, the good roads are about a 200 mile trip, but the much shorter route means dirt roads up over the Rockie Mountain passes. With the threat of rain, was it more or less merciful to send the peloton the shorter route? As the road started up the big climb of Kalber Pass, the twelve man group off the front began to thin down these five only include one member of a ProTour team, Matej Mohoric of Cannondale, who was joined by Robin Carpenter (Hincapie Sportswear) Kirk Carlsen (Jelly Belly) and Jai Crawford (Drapac). The race organizers had brought out the street sweepers early in the morning, so the road was certainly better than the pave sections of stage 5 of the 2014 Tour de France. This is a small original watercolor and ink painting that is available through my artist website at www.greigleach.com. To purchase this painting just follow the direct link at the end of this post. With a large break away like this one of twelve riders, there are those that will skip their turns in the wind, not sharing the work load. After winning the King of the Mountains Jersey, Ben Jacques-Magnes (Jamis) by getting into a break yesterday, felt that it was his job to make sure everyone work. However, Chris Jones (UnitedHealthcare), who's teammate was in Yellow, felt he deserved a pass, after all, why should he help pull someone else into the overall lead? This led to a number of hand gestures from Jacques-Manes, but in the end Jones stayed on the end of the group anyway. This is a small original watercolor and ink painting that was created using Yarka St. Petersburg watercolors and Steve Quiller brushes from Jack Richeson & Company, www.richesonart.com. In addition, this little 4"x6" painting is available through my artist website at www.greigleach.com. To purchase this painting, just follow the direct link at the end of this post. But while you are there, why not take the time to browse all of the art on offer. Be warned, there is a lot of art on offer. All is fair in love and war, or in this case, friendship and sprinting. Alex Howes (Garmin Sharp) reaches over to congratulate his best friend, Keil Reijnen (UnitedHealthcare) even though Keil had just outsprinted him for the win. With his victory in downtown Aspen, Reijnen will wear the first Yellow Jersey of the 4th edition of the US Pro Challenge and Howes will start the day in second place overall. Howes had the jump on his good friend, but perhaps all of the kilometers of his first Tour de France, had left him just that much slower than the fast charging Reijnen. This is a small original watercolor and ink painting that is available through my artist website at www.greigleach.com. If you would like to purchase this painting, just follow the direct link at the end of this post. The very select peloton was about to let Jens Voigt (Trek) steal their thunder and pulled the strong man back into their midst. Although most of the true sprinters and three quarters of the riders in the race, were dropped in the chase of the fabled German. With his teammate Janier Alexis Acevedo (Garmin Sharp) on the front, Tom Danielson gestured angerly for something. Most likely he wanted more of his teammates on the front so he could gain as much time as possible. Tucked onto his wheel was most of BMC, bringing their man and defending champion of the race, Tejay van Garderen into the business end of the petite peloton. 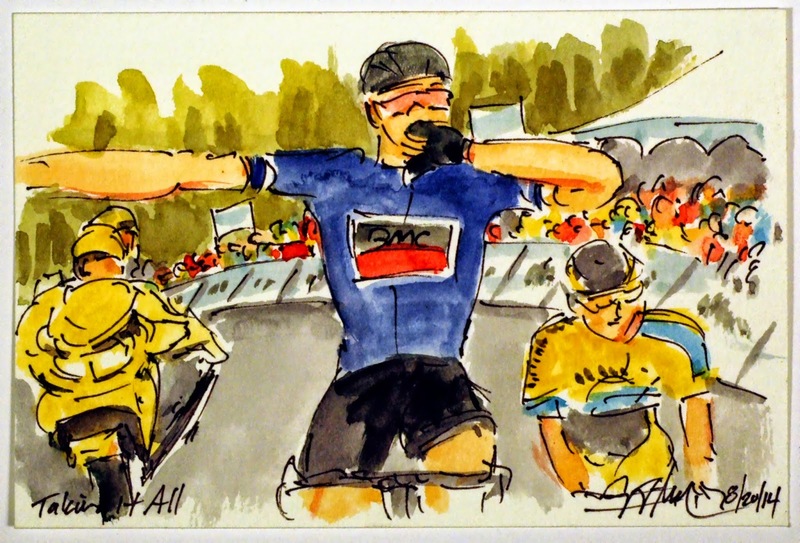 Van Garderen had Peter Stetina and Michael Schar, both of whom had shepherded the American through the most recent Tour de France. This is a small original watercolor and ink painting that is available through my artist website at www.greigleach.com. If you would like to purchase this painting, just follow the direct link at the end of this post. Jens Voigt (Trek Factory Racing) has been doing quite a few things for the last time this his final season. One of those things is this race. This will be his final professional race before he hangs up his tubulars and hangs out with his kids. 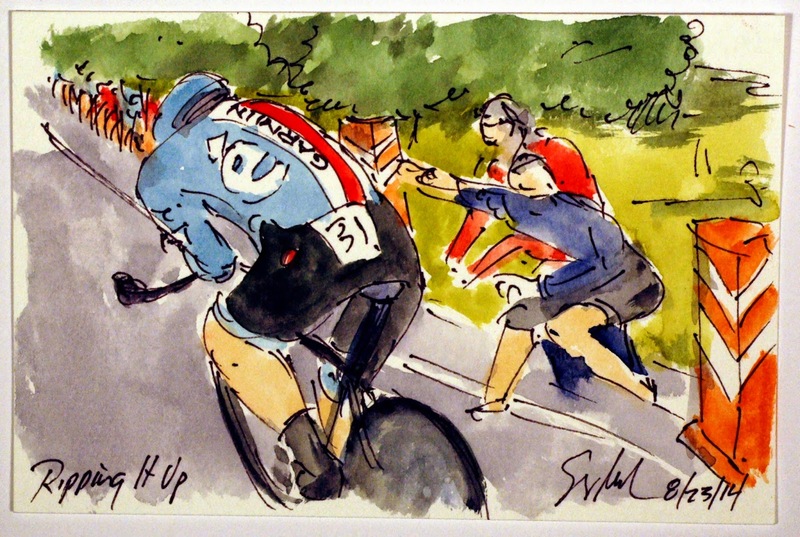 However I doubt it will be the last time we see him attack the peloton over the seven days of the US Pro Challenge. Voigt had gone solo to bridge up to the lone figure of Ben Jacques-Maynes (Jamis) but then just kept going. With just one more climb and the descent into Aspen, he could well have been riding for the first Yellow Jersey of the race. 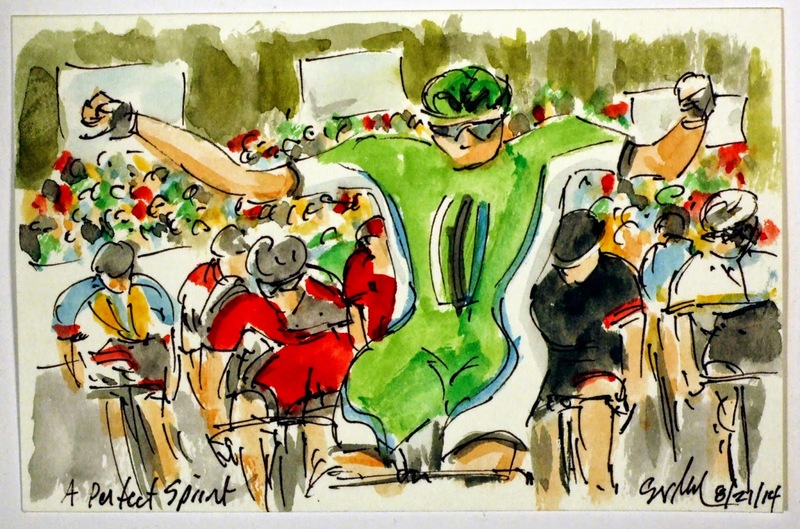 Voigt is old enough to be the father of a large percentage of this peloton, but he is still racing with the enthusiasm of youth combined with the wisdom of old age. This is a small original watercolor and ink painting that is available through my artist website at www.greigleach.com. To purchase this painting you can follow the direct link at the end of this post. On his final lap around the hilly circuit Ben Jacques-Maynes (Jamis Hagen Berman) felt that the peloton was getting too close and his break away companions, including his teammate, weren't working hard enough to stay away. 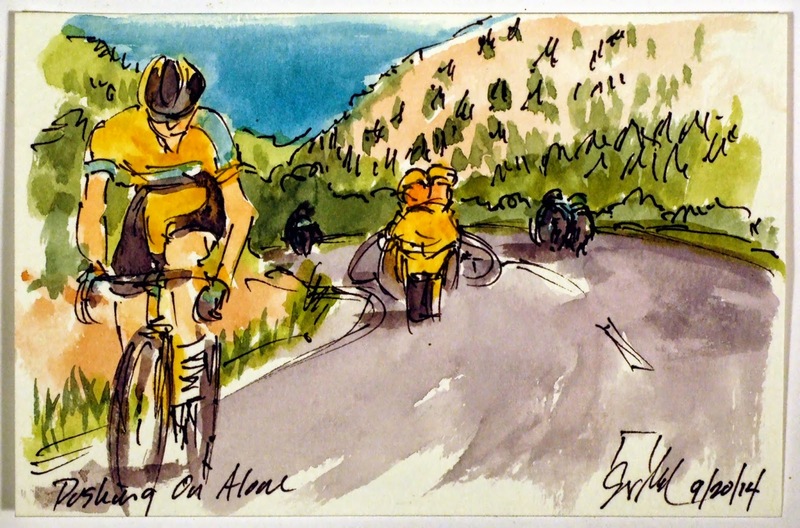 So in the valley before the first climb of the loop, he jumped out from behind the group to try to take a solo run back down into Aspen for the stage victory. Whoever manages to win the stage will also pull on the first Yellow Jersey of the fourth edition of the race. This is a small original watercolor and ink painting that is available through my artist website, www.greigleach.com. To purchase this painting, just follow the direct link at the end of this post. 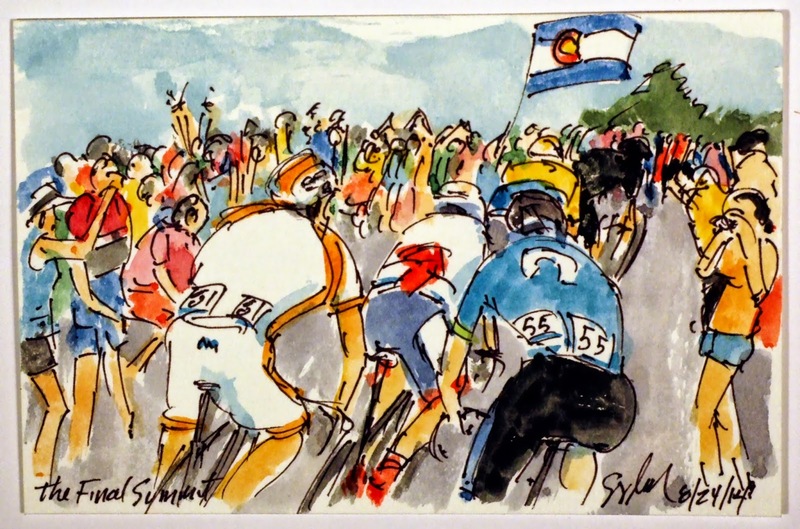 The fourth edition of the US Pro Challenge, sometimes referred to as the Tour of Colorado, got underway on the slopes of Snowmass and Aspen. Daniel Summerhill (UnitedHealthcare) was the first to attack the peloton. He was joined by seven others including Lachlan Norris (Drapac) and Jonathan Freter (Jelly Belly) among others. The group set off on the 61 mile circuit race between the two Colorado towns that feature to pretty hefty climbs. Maybe not as big as the climbs of the Tour de France, but at a much higher elevation. Aspen sits as high above sea level as most of the summits of Europe and today's King of the Mountain points were another 1,500 feet up. This is a small original watercolor and ink painting that was created using Yarka St. Petersburg watercolors and Steve Quiller brushes from www.richesonart.com. 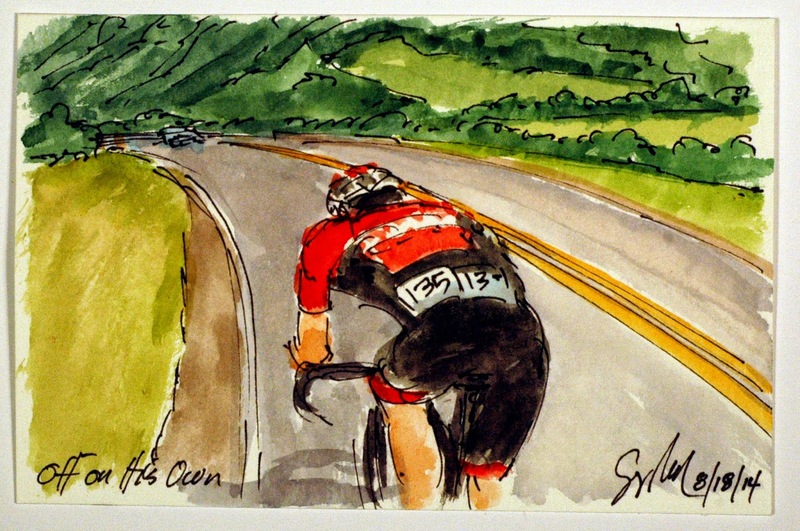 In addition this painting and all of my cycling art is available through my artist website at www.greigleach.com. To purchase this painting, just follow the direct link at the end of this post. Bike racing is bike racing regardless of who is on the saddle and the cobbles of the Champs Elysees are just as rough for the inaugural La Course as they are for the 101st Tour de France. Ana Teresa Casas Bonilla (Estado de Mexico Faren) discovered just how rough the surface of the avenue is the hard way as she tangled wheels with a rider from Austalie. This is a small original watercolor and ink painting that is available through my artist website at www.greigleach.com. To purchase this particular painting just follow the direct link at the end of this post. While you are there why not take a look at all of the paintings on offer. 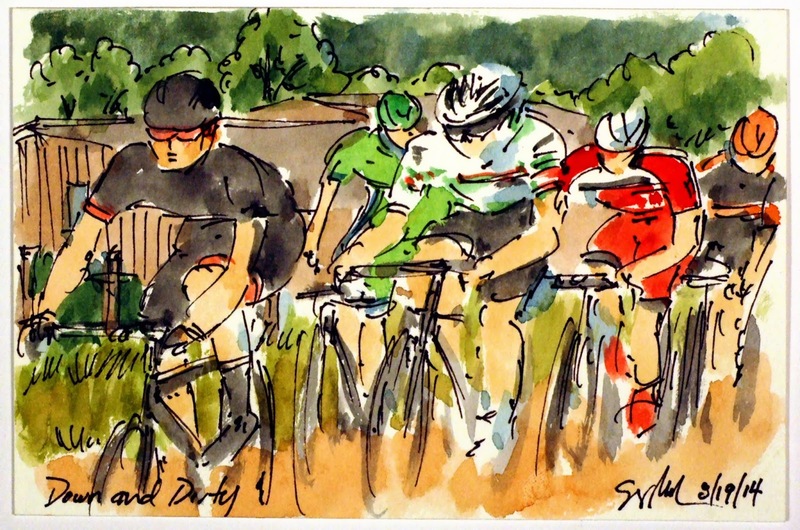 This painting will be part of my soon to be published, "Book de Tour: art of the 101st Tour de France". Check back to find the link to purchase the book in a week or two. 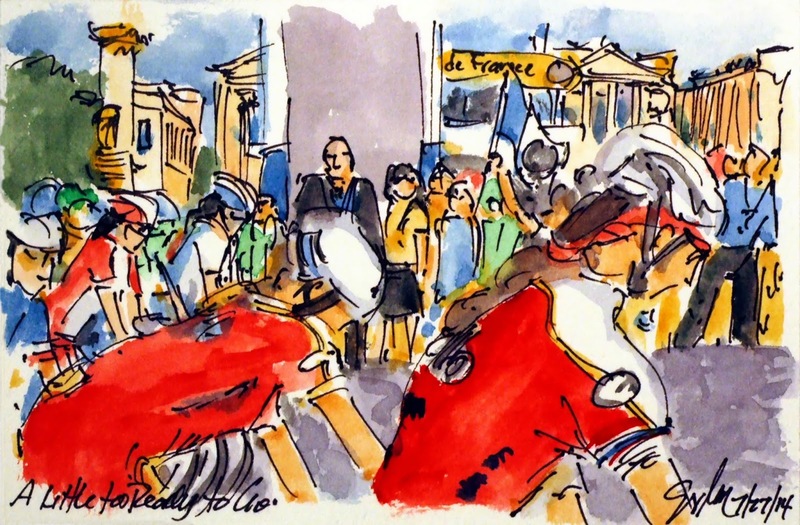 A UCI sanctioned Women's Pro Cycling race was a long time coming to the Champs Elysees and the women who lined up on the fabled cobbles were very eager to get this historic race underway. 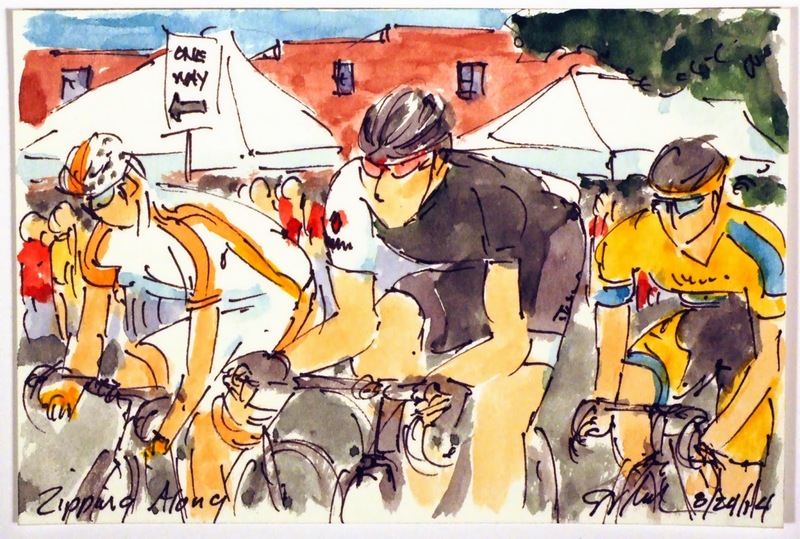 The race would be contested on the same course that the men will be on as they finish the Tour de France. La Course will be thirteen laps between the Place de Concorde and the L'Arc de Triomphe for a total of 89 kilometers of hard fought racing. While the start flag was stilled held aloft a couple of riders from Team Rusvelo got an early jump off of the line. They quickly realized their error and but their feet down just as the flag was dropped to start the inaugural contesting of La Course. This is a small watercolor and ink painting is available through my artist website at www.greigleach.com. To purchase this particular painting just follow the direct link at the end of this post.